All community members (adults) are invited to be part of this community-wide event to help PPIE support all Pleasanton schools. Read more about it here. 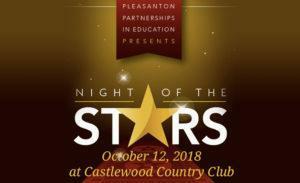 This year's PPIE gala will take place on October 12, 2018 at Castlewood Country Club in Pleasanton from 6:30 – 10:00pm. Tickets are $85 per person and can be purchased via EventBrite. Tables for 10 are also available at a discounted rate of $700.